Tree rats (sometimes known as grey squirrels) are vermin introduced to this country from the USA in the 19th century. Since then, they have decimated the native population of red squirrels (usually known as proper squirrels) and invaded woodland, parks and gardens throughout the UK. 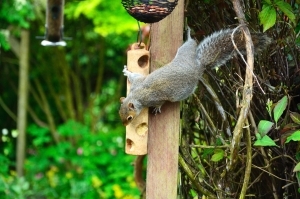 Grey squirrels are the most omnivorous animals ever known and examination of their droppings and stomach contents has revealed the presence of chestnuts, voles, celeriac, lithium batteries, spoons, golf balls, souvenir thimbles, seaweed and Vespa scooters. There are numerous examples of grey squirrels nesting in people’s attics, often chewing through electrical cabling and burning down the house as a result. According to the Metropolitan Police, grey squirrels (or GSQ Crew as they are known in the city’s criminal argot) are actively involved in the supply of drugs, prostitution and people-smuggling, while the recent rise in the population of rural squirrels is directly mirrored by the increase in rustling and theft of farm equipment. Even with this weight of evidence against them, grey squirrels are still encouraged by some pensioners – a foolhardy course of action illustrated by the fate of Gordon Spackman of Towcester, whose nuts were chewed away while he dozed in a deckchair in July 2011.